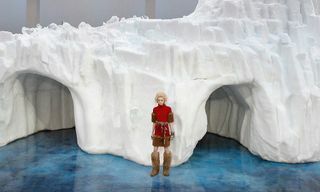 Given that seasoned Chanel showgoers have previously been taken on journeys to Antartica, the airport, and even the supermarket, the house’s FW17 out space theme isn’t all that surprising. Also, space tourism isn’t as far-fetched as it was a few years ago, given that Virgin Galactic, the world’s first commercial spaceline is currently testing flights. For the super rich who can actually afford a flight to space, a Chanel uniform is très essential, non? Chanel’s FW17 outing was a mega show, obviously. The set was phenomenal and it even featured a full-on rocket that literally took off (albeit only several meters) at the show’s climax. 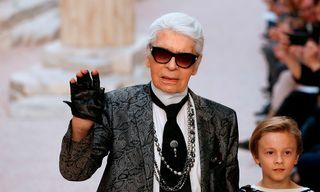 When it came to the clothes, Lagerfeld stayed true to his deep space theme, offering plenty of silvery, futurist details like glittery moon boots and his own take on the humble space blanket. The invite sent out to attendees teased Chanel’s galactic theme well before today’s show. The invitation featured a neat rocket illustration, and while plenty of showgoers expected to be emotionally transported, we doubt any of them expected to see an actual rocket blast off, IRL, at fashion week. As soon as you walked into the iconic Grand Palais, it was impossible to not miss the huge rocket, and it was pretty obvious from that point on that Chanel FW17 was going to be out-of-this-world. The glittery knee boots with patent contrasting toe-tips that accompanied every single look were particularly eye-catching and they went out in a few different colorways. The silver astronaut backpacks in a seriously hulking size proved the oversized trend is going nowhere. Karl Lagerfeld also sent out a slew of menswear looks, potentially hinting at the possibility of a dedicated menswear line? 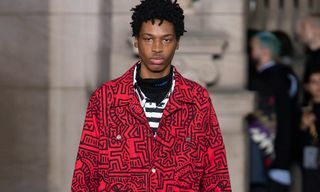 The men’s looks were pretty pared back compared to the womenswear offering at large. For the guys, the palette switched from platinum to shades of ecru and champagne with flashes of white. Chanel’s front row is always studded with stars, and Chanel FW17 featured a coterie of VIP names including Skepta, Pharrell, Future, Cara Delevingne, Lily-Rose Depp, and Rita Ora. The likes of Kendall Jenner, Gigi Hadid, and Bella Hadid all walked the Chanel space-themed show too. Even the most blasé of seasoned fashion editors couldn’t resist being impressed by such a ridiculous spectacle. Yep, Chanel literally launched a rocket inside of the Grand Palais at fashion week. 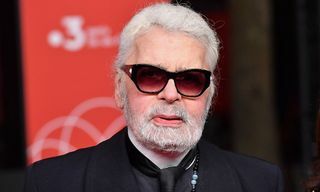 As the show wound down, the man of the moment, Karl Lagerfeld, and his godson Hudson Kroenig, took to a podium in front of watchful attendees to push the “blast off” button. It triggered a countdown, the rocket made some noise and then proceeded to rise several meters off the ground with Elton John’s “Rocketman” blaring in the background. Finally, the models emerged to take their final lap and it was all over.